Tell us the one travel-related thing you’ve always wanted to know… but never managed to find out?!! You answered with an avalanche of awesome questions for us to *wrastle* with. This post is our first opportunity (in a while) to don our luchador masks and take one of them to the mat. Hit us up here with more questions. How many digital nomads are there in the world? –Samuel L.
WHAT ARE DIGITAL NOMADS ANYWAY? Related: Is there a better phrase than “digital nomad”? by James Clark, Nomadic Notes. Nailing down just what digital nomads are is surprisingly difficult. There are those who wear the badge proudly and those that cop to being digital nomads for convenience’s sake. Some find the term too trendy, pretentious or overused and prefer not to be labeled. Others, who have worked while traveling for years, simply aren’t aware of the digital nomad debate. They don’t realize that they fit the description. Another group that has a substantial amount of freedom in their working lives – control over their own schedule, the ability to work remotely etc. – chooses not to travel due to family obligations or personal circumstances even though they could. Still more travel so slowly or infrequently that they stretch the definition ‘nomad’ to the breaking point. Topping off this whole layer cake is a thick frosting of aspiring digital nomads who are still plotting, planning, scheming and saving up for their first trip. Are able to work remotely and travel for a sustained period (longer than a typical vacation). Use technology to perform their jobs (that’s the digital part). Actually get out there and move (Yeah, actions > intentions, but keep honing your skills and filling that piggy bank and you’ll get there, aspiring nomads!). ARE REMOTE WORKERS THE SAME THING AS DIGITAL NOMADS? According to the New York Times, a recent Gallup survey of 15,000 adults found that “43% of employed Americans spent at least some time working remotely” in 2016. That’s huge! 43% of the US labor force is roughly 66 million people who spent a portion of last year going remote. That means that even if the term digital nomad still raises eyebrows, remote work is already mainstream. 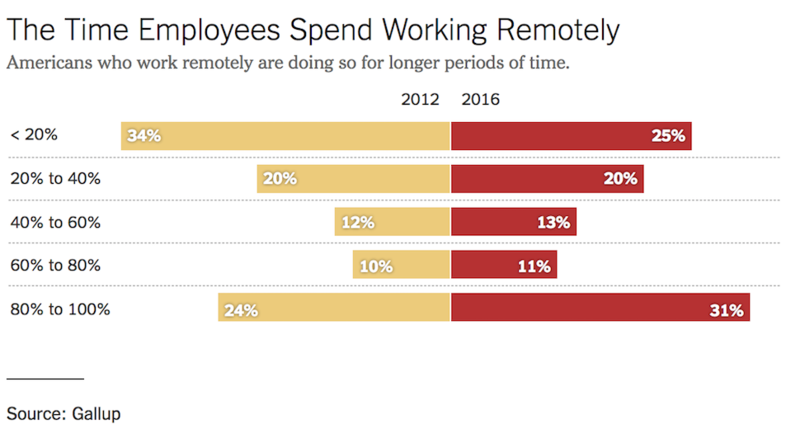 More importantly, the trend toward increased remote opportunities is likely to continue because 1) so many employees crave flexibility and 2) employees that have an opportunity to work remotely feel more engaged at work, not to mention companies save on expensive office space… In the next few years at least some amount of location independence will become part of most people’s working lives. Employees that work remotely are also spending more time away from their desks than ever before. The number of remote workers who spent 80-100% of their time off-site has increased by 7% in just four years. At the same time, the proportion of those that are out of the office less than 20% of the time has decreased by 9%. The number of full-time nomads is increasing and the dabblers are transitioning into part-time nomads. If being away from your desk more often than not makes you a nomad, somewhere around half of the remote workers in the US have the potential to digital nomads of some sort already. Nonetheless, while an impressive 31% of those surveyed were out of the office from 80-100% of the time in 2016, the majority still spend only part of their time away. Of those part-time remotes, most are at their desks a few days each week rather than spending eight months onsite and four on the road. In other words, there’s a large contingent of the workforce that’s able to work remotely for much of the week, but not for weeks on end. Technically they’re able to travel most of the time but they may have difficulty staying on the road for a sustained period that’s longer than a typical vacation. According to Gallup, employee engagement actually rises when three to four days per week are spent working remotely. 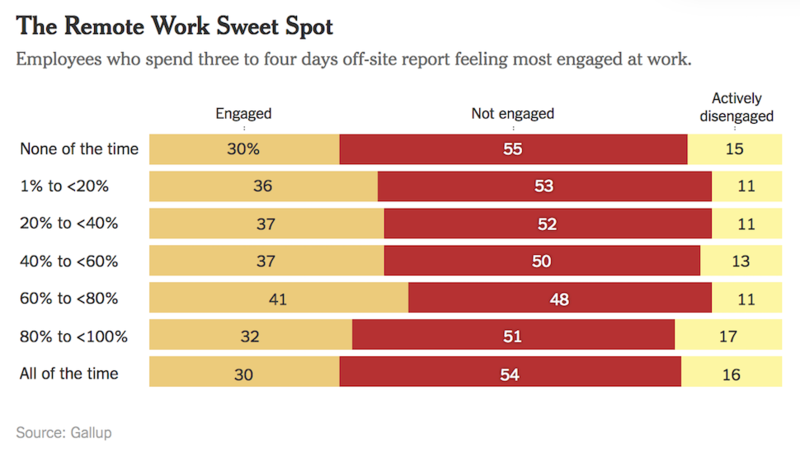 Surprisingly, working remotely all of the time is no worse for engagement than reporting to a cubicle day after day. Although most remote workers are still anchored to a location, practically speaking if they only have to show up at work a couple of days a week, that still gives them a lot of time to play with as a ‘local nomads’ even if they can’t travel for extended periods to distant destinations. DO YOU HAVE TO TRAVEL INTERNATIONALLY TO BE CONSIDERED A DIGITAL NOMAD? Jet-setting to far-flung continents on a weekly basis is expensive, even for sorcerers schooled in the dark arts of mileage point accumulation. If you’re not paying with your wallet, you are with your sleep cycle. So, is long distance international travel a reasonable prerequisite for nomadry, (New word. You’re welcome. 😉 ) or does a short bounce from Ft. Worth to Austin count as nomading around? The popular perception of digital nomads includes sipping coconuts in Phu Quoc one week and stand-up paddling Bocas del Toro the next. So, if you’re hanging out in your hometown of St. Louis, your Instagram feed may not exactly be radiating that nomad glow. But hang on a minute, working from a hip cafe in Hamburg isn’t all that exciting if you’re a short drive from your parents’ house in Lübeck. Everywhere is somebody’s hometown–exotic to some, but distinctly less so to others. And besides, you can always take a selfie on a SUP in your local canal and tag it #nomadlife. Freedom is a state of mind and while local nomads may not be able to live abroad full time, they still have substantial optionality. They aren’t forced to report to a desk and they can pack up and go regularly if they choose to. Even if they are required to be onsite a couple of days a week, commuting once or twice instead of daily makes longer trips easier to endure. That gives so-called ‘local nomads’ the ability to live in and repopulate the small towns and villages that were fading from the map just a few years ago. When it comes to a shared digital nomad mindset, self-determination, control of your schedule and location independence (even if limited) seem at least as important as a collection of passport stamps. We’re getting closer to a concrete number, but so far our data has been US-only. Time to stir in the rest of the world, chuck the whole project in the oven and watch it rise. Let’s assume that generally speaking, the digital nomad option is mostly exercised by people from developed countries. If we use the US as a proxy and add up 20% of the labor force from the CIA World Fact Book list of 33 developed countries, the total population with nomad potential is around 99 million. Even if only a small fraction of them fit the popular image of the jet-setting full-time digital nomad, that’s still a very big (and still growing) number. It’s important to note that Instagram-style #nomadlife is more a series of moments than a permanent condition, even… or perhaps especially for full-time digital nomads who’ve been traveling for years like Jodi Ettenberg of Legal Nomads. She uses her location independence to spend extended periods of quality time visiting family and friends ‘back home’ even though she doesn’t have a permanent base. One of the biggest benefits of being a digital nomad is the discretion to spend time on the relationships that really matter. After a few visits, once-‘foreign’ places feel more and more like home. That begs the question, how often do you have to visit and how long do you have to stay to be considered an expat or resident than a nomad? Is novelty a factor in the digital nomad equation? And what happens when most working people have substantial and growing location independence? At what point do people who like to travel and work online stop being ‘digital nomads’ and go back to just being, well, human beings? So there you have it Samuel L…. Granted, there’s been a substantial amount of rounding involved.😜 Only a fraction of full-time nomads are actually riding a scooter to a zip line through the jungle at this very moment or hailing a tuk-tuk to catch their next flight. But one thing is for sure: you are most definitely NOT alone out there. What matters more than ‘how many digital nomads there are in the world’ is how many you connect with. Keep moving and thanks for sending us on this ramble with your awesome question! Why stop at millions? We’ve got a long road ahead to reach Pieter Levels’ estimate that “There will be one billion nomads by 2035.” But ‘on the road’ is exactly where we belong. His bold claim may not be that far off (just) 20 years from now.